Discussion in 'General Discussion' started by Texas_minor_blues, Nov 9, 2018. 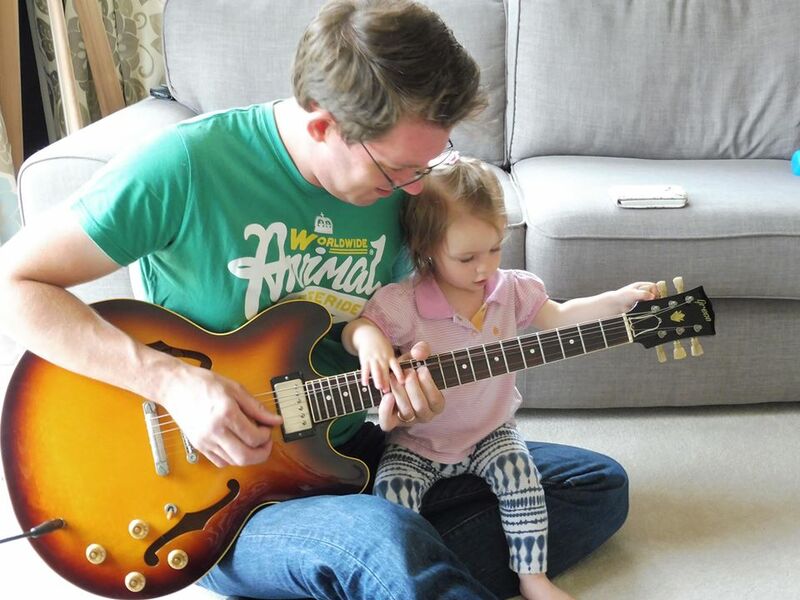 So how do you family folks make time to enjoy your guitars? bodia, ScottR, Glide-bpm and 1 other person like this. I stay busy, but ya gotta find a little guitar time!!! Although I'm retiring in less than 2 months... aCk!!! But it ain’t worth gettin’ Old. LSchefman, ScottR and Glide-bpm like this. I ain't gettin' old...... I'm going on semi-tour!!! 11top and ScottR like this. Me neither...........no “gettin’” to it. veinbuster, ScottR, Alnus Rubra and 1 other person like this. I guess that's me in that situation too. Full time work, two young children (3 1/2 and 2) etc etc. I can't say that I make time for guitars, rather than I just take the opportunities that are there. I do tend to have a few hours free in the evenings at the moment as my wife is studying for an Open University degree, so that's my main guitar playing time. But it does tend to only be a bit of noodling on the sofa unplugged whilst I watch something on TV. At the weekends I may also grab a guitar whilst the kids are playing and I'm watching over them, though they'll often come over and want to play with all the switches and buttons. I don't mind. I like that they get the exposure to the instrument. So playing time isn't too much of a problem. What I struggle with is finding time to play through actual amps as the majority of my playing is when the children are in bed. I didn't even turn on a valve amp for 2 years recently. My THR10 is my lifesaver, it lives in the lounge and is the main thing I play through at the moment. I play as much my hands and mind can stand everyday (and most nights). Without fail, I litterally play for 5-8 hours per day...everyday...but I very rarely play play thru an actual amp. For several reasons, the main one being, I still stink at it, and nobody needs to be tortured by that...and secondly because I dont want to be stabbed to death in my sleep by the mean ginger I'm married to. So, about 85% of mine is done with my cans on. I say do your best to play for no less than 10-15 minutes a day no matter what...ya gotta play everyday. bodia and Glide-bpm like this. DreamTheaterRules, ScottR, bodia and 4 others like this. I put it down for almost ten years. It just wasn't enough of a priority at the time. I had five kids and a full time, self-employed, job and a house to take care of, etc. There just wasn't time and I wasn't making any money at it.... So, it fell to last place. Then, one day I got approached to play at a neighborhood party with some buds and the next thing I knew I was gigging. The kids got older and took less time. Now, I play semiprofessionally (about half my income is from music). It just became a priority again at some point. The only way to find time is to make it a priority. If it's something you wanna do for fun, or stress relief, as someone already said, make a little time for yourself. It sounds like you have a lot on your plate, so no matter what, don't stress it. It can be frustrating not making any progress or seeing the guitars collect dust in the corner, but one day, it'll fall back into place. The best I can do is choose time. I might have played guitar more before I retired - alone in an apartment away from home. I will often play a bit through headphones when the Mrs goes to bed. I can lose a little sleep. Speaking of the Mrs, she's very supportive and encouraging, so we have our "me" nights where I'll play guitar a couple hours and she'll do her own thing. Sometimes I squeeze in a little playing between work and dinner. That's a good chance to get in a little amp time. I work from home a couple days a week. I'm very busy lately, so don't get to do this as often as I'd like, but I'll take a break to play a bit. That's the other good chance to get in some amp time. I will often have a guitar with me on the couch when watching TV. I can at least get in a little noodling that way. Goals are good. Accountability is better. I play with the blues band once a week, building up our repertoire. I need to be prepared for that. I play with an original/covers band several times a year, so have to keep that stuff fresh-ish and prep for the gigs when they come. Finally, I keep at least a few guitars out in the spare room. When I see them, it's very difficult to resist the temptation to pick one up and play! In terms of time, I just treat it as if it were a part time job. It has to be done. My advice is not to set aside time for it. Treat it as a bodily function, like taking a leak. You don’t schedule that, it’s just something you need to do every so often. Where’s it carved in stone that you need a big block of free time to play? Pick up the guitar for one song here and there. There’s always three minutes at some point in the day. WA Paul, veinbuster, garrett and 1 other person like this. Playing guitar is a nervous habit, like grazing on snacks, smoking, or picking your nose. I just leave a few out and about and randomly pick them up throughout the day. Boogie, ScottR, garrett and 2 others like this. Glide-bpm and sergiodeblanc like this. LSchefman, Glide-bpm and sergiodeblanc like this. I’m risking it, but my lil dude did pull a guitar off the dining room table the other day. LSchefman, bodia and Glide-bpm like this. I joined a band, so I HAVE to practice. bodia, Glide-bpm and garrett like this. Those are great points. I take it for granted that playing has been a compulsion for me since I was 13-14 years old. If you plan stuff, it gives you excuses to cancel. FWIW, I have always left a guitar laying about regardless of my kid's age. Not the fancy stuff when kiddo was smaller, but still.